Whatever job it’s for, big or small, when you need a strong and versatile asymmetric carbine hook C/W screw nut then look no further than Rope Services Direct. 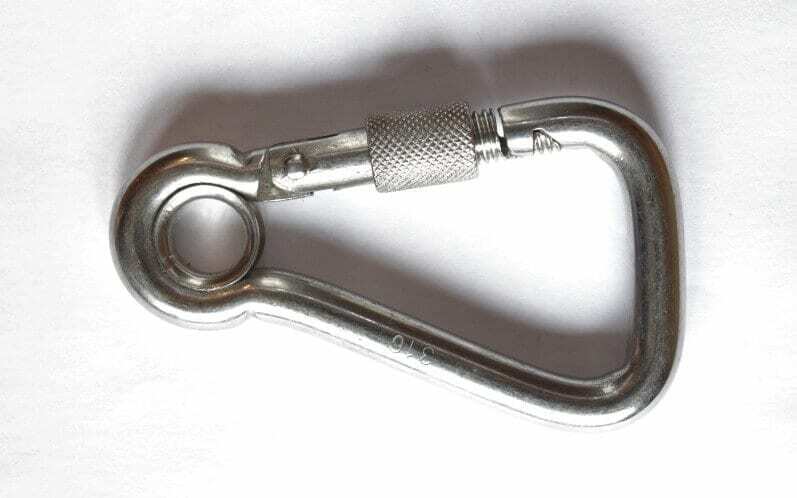 Also known as a Carabiner or Karabiner, this stainless steel hook has a spring controlled gate mechanism which when closed is then held in place securely through a screw nut. The beauty of these carbines is they are quick and simple to use for connecting parts in systems where safety is off the utmost importance, for example in mechanical or industrial work. All our carbines comply with EN 362:2004 ‘Personal protective equipment against falls from a height’. Locking carbines are very similar in shape to non-locking ones but have an additional sleeve around the gate which is held in place by tightening the screw. This means the carbine won’t open accidentally. Our asymmetric carbines are made using 316 grade stainless steel so are exceptional for use outdoors. Not only does this make them very durable, it offers a wide variety of uses such as parachuting and climbing. These hooks come in sizes between 6mm and 11mm in diameter. From our substantial warehouse near Birmingham, Rope Services Direct can offer a large range of carbine products, suitable for a variety of purposes. You’re bound to find the ideal carbine hook you need with us. To purchase your new hook, simply send us a filled out enquiry form here. If you’d like to talk to us about your project or need some more advice, please do drop us a line on 01384 78004 so we can help. Asymmetric Carbine Hook c/w Screw Nut Overall rating: 5 out of 5 based on 6 reviews.